On this site (19th June), reference was made to an article in the Times, in which the values, principles, beliefs and manners of the ‘employing classes’ were extolled as an example to be emulated by underprivileged children. But the decisions made by the political-corporate alliance to which the more prosperous belong are responsible for the lack of decent employment, education and health care offered to the itemised pupils – in poorer Muslim community, black council-estate children, white working class in sink comprehensives and Roma. They make possible changes such as shorter hours (so that more can be employed), different working patterns, ideas such as “social” wages, negative income tax and job-sharing “uneconomic” work. An agreed percentage of any profit made has to be ploughed back into the enterprise and the co-owners decide jointly how the rest shall be used. a commitment to sourcing local as well as global produce. All Daily Bread profits are reinvested into the business or donated to the co-operative’s own international charity, ‘Strive Overseas’, which funds small projects, often in the countries Daily Bread sources foods. Read an article by Sawtell here. 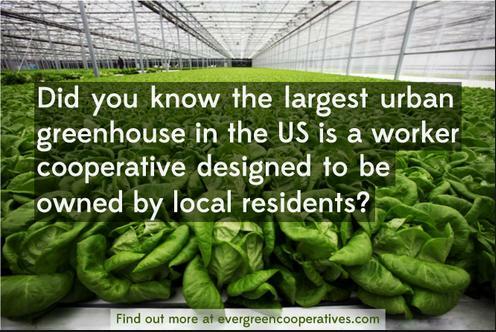 Looking further afield, the Evergreen Cooperatives of Cleveland, Ohio are employee-owned, for-profit companies are based locally and hire locally. They create meaningful green jobs and keep precious financial resources within regional neighbourhoods. Worker-owners at Evergreen earn a living wage and build equity in the firms as owners of the business. “In a world awash with lyrical corporate mission statements about ‘excellence’, ‘service’ and ‘ethical dimensions’ worker co-ops actually have their values at the centre of the business not just as add-on extras. Worker co-operatives are businesses which are democratically controlled by the employees. Internationally recognised co-operative principles also include: equitable distribution of any surplus, limited return on capital, co-operation between co-operatives, and social and educational aims . . .
“These businesses are concerned about doing things that are useful and socially desirable – not just about maximising profit. There are numerous worker co-ops providing childcare and homecare for the elderly and at the same time ensuring work for local people who want flexible hours. It’s not the bottom line that counts but what’s above it – for co-operatives . . .
“Co-operatives often mentioned their environmental concerns in their replies to the questionnaire and how they were seeking to reduce their environmental impact. Some – architects, designers, energy and transport consultants – are specifically looking for solutions that reduce environmental damage. Several firms are designing buildings for low energy use . . . “ Full text here. John Endersby summarises: Worker co-operatives seek to replace greed by need as the driving force in industry . . . . they will not bring Utopia overnight – the powerful minority who profit enormously from the present system will fight against even minor reforms – but above all they have the potential to enable hope in abundance to replace the despair threatening to engulf young and old alike, offering them useful and rewarding employment. Posted on June 20, 2014, in Conflict of interest, Corporate political nexus, Planning, Vested interests and tagged Beliefs, Corporate mission statements, Daily Bread, Equal pay, Evergreen Cooperatives, Job sharing, John Endersby, Mary Holmes, Maximising profit, Powerful minority, Principles, Quaker Socialist Society, Roger Sawtell, The ‘employing classes', Useful employment, Values, Worker co-operatives. Bookmark the permalink. Leave a comment.